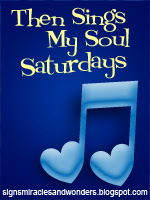 It's Then Sings My Soul Saturday and I'm linking up with Amy of Signs, Miracles and Wonders. The past few days have been full. I had the pleasure of spending a short time with my blogging friend Kathleen of Sassy Granny. She recently moved back to Seattle to be closer to her kids and grandkids. But she and Terry came back to the Phoenix area to visit friends and relatives. I was honored that she took the time to go to the Rio Vista Recreation area so we could sit and chat. Notice the "Do not feed the ducks" sign. I think everyone ignores that as they kept pestering us the whole time and even grabbing my finger. But Kathleen and I still had a great visit! Then I was off to do my first garage sale. My good friends Jack and Anna May have the perfect home location; on a visible corner. They were kind enough to allow me to haul my stuff to their driveway. I thought this was all I had to do and they would come. LOL. But no, I didn't spend the whole time in the hammock. I had much help from my friends. Unfortunately, John and Helen still couldn't sell that Christmas tree. But Helen knows so much about garage sales and pricing. Thank you Helen and John! Thanks Anna May and Jack! And finally, here's my song for this week. I woke up with this song in my head today. However, it had been playing yesterday at my friend's house so it must have stuck with me. It's a good one and I hope you enjoy it too. What a beautiful time and friendship you have! Love you and can't wait to meet you in person!!! That hammock is very inviting! Have a wonderful weekend, my bloggy friend! You look adorable posing in the hammock. Good to be busy and share life with friends. 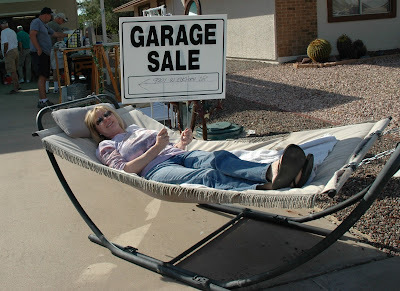 Hi Debbie, Loved seeing you in the hammock and of course your friends at the garage sale. I pray the Lord surprises you with blessings galore and more importantly His grace. Jesus, what a beautiful name"
This is a new song to me. Hope you have a great weekend, Debbie! debbie, this song is so beautiful. this may sound weird but while listening to this song, i was reminded of my husband. i miss him. the music sounded like that of a secular band's music my husband and i both like. i really miss my husband. i know in God's perfect time, everything will be all right. The hammock looks really comfy. My first time hearing it. The video is just awesome. Great song to head into this weekend. Never heard this one before but I like it. Jesus, what a beautiful name and how awesome He is! I love that song, though I've never heard that version/artist. I'm glad you got to spend time with friends and have fun! Hope all of you had successful sales :o) The weather looks like it was gorgeous. Hi my friend, you and Kathleen are so precious to me! Would have loved to have been there chatting with you. Love the photos...you look busy at work getting things done in that lounger (smile). Just discovered your blog! Looks like you had a great garage sale!! It looks like you had a great and splendid day!!! I love the pics. Blessings to you!!! Hi Debbie, I'm trying to visit a new blog every day before the end of the year, and today you're my new visit :) Came over from Elaine's Peace for the Journey. Guess what? I have a sister named Debbie, and she is from the Phoenix area, too. Small world, huh? Blessings to you this week! just like to say that i can't get this song out of my head. i love it already! beautiful song. Hope the garage sale was a success!